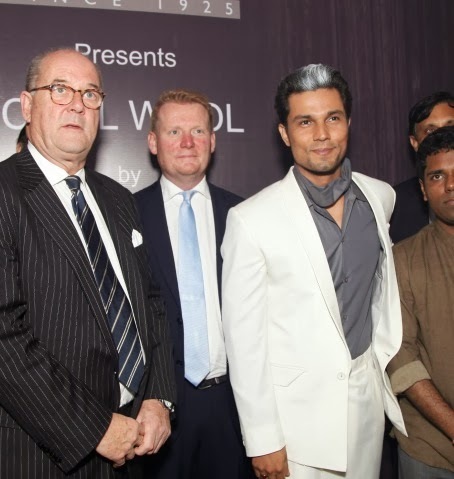 The Woolmark , the world’s best known textile fibre brand, established in 1964, Collaborated with Raymond to show off their Merino at The Australian High Commission in Delhi. 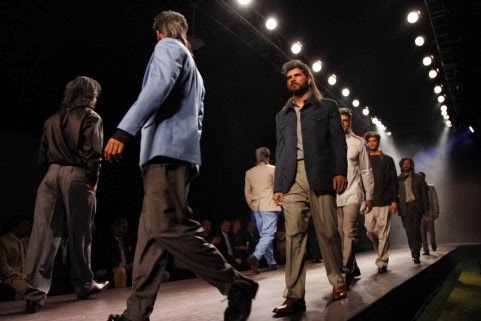 The Evening witnessed a spectacular fashion show and some cool wooly collection on the very much dapper Randeep Hooda, and of cource some spruced up hot models, walking the ramp in Raymonds and looking nothing less than A complete Man(men). Its time we say Bye-Bye to the whole tropical weight wool which we can't just wait to take off and instead welcome the cool wool collection cool enough for even the most easily overheated. 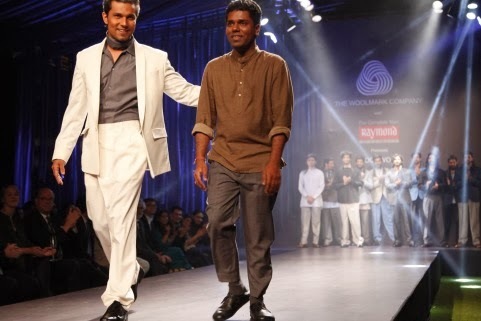 On display at a fashion show was a collection of more than 20 garments designed by Indian fashion designer Jai Gupta – with contemporary styling, finesse, and subtle designs. This collection will be introduced in the market from March 2014 at Raymond stores and leading multi-branded outlets in the country. I really love this idea of Slouch Business pants instead of the fitted ones. These are perfect to wear casually and formally both. In a continuous effort to promote wool as a trans-seasonal fibre in India, The Woolmark Company and Raymond have entered into a partnership to launch a complete new Cool Wool collection for Indian customers. 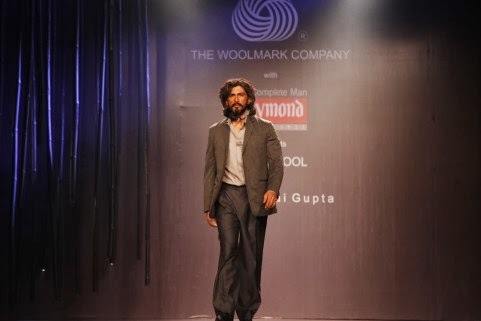 The partnership reiterates The Woolmark Company’s commitment to drive awareness about the plethora of benefits that wool offers and is strengthened by joining with Raymond - India’s leading menswear brand and the leading manufacturer, marketer and retailer of worsted suiting fabrics over the past eight decades. Cool Wool garments are manufactured from lightweight Merino wool fabrics with a maximum weight of 190 g/m² and a maximum mean wool fibre diameter of 22.5 micron. Merino wool is used for its natural, breathable and thermal-management properties in lighter-weight fabrics for warmer climates such as India’s. The Cool Wool range from Raymond includes 100 per cent wool fabric as well as blends with natural fibres including silk, cotton and linen. Peter Ackroyd, global strategic advisor for The Woolmark Company said “India has a tropical, climate and customers avoid wearing wool garments in summers, as they clearly identify the fabric with winters. We want to negate this notion. Indian customers need to understand the true potential, versatility, and the benefits of using wool in summers. With Cool Wool, we are confident and believe that Indians will fathom the adaptability of wool in summers. Australia’s Acting High Commissioner, Mr Bernard Philip, said “Australia is the world’s leading wool producer, accounting for around one quarter of the global wool production and Australia has a long tradition of trade with India in wool. In 2012-13, India was the second largest market for Australian wool and Australia was the largest source of India’s wool imports". The Woolmark brand is owned by Australian Wool Innovation (AWI), a not-for-profit company owned by more than 27,000 woolgrowers. AWI’s vision is to be a significant contributor to a vibrant, stable and profitable wool industry providing the world with the best natural fibre. The company works throughout the global supply chain – from woolgrowers through to retailers. The company mission is to enhance the profitability, international competitiveness and sustainability of the Australian wool industry; and increase demand and market access for Australian wool. Merino wool provides stability, resilience, softness and luxury to the tailoring industry. The fibre has long been a favourite of designers, but younger consumers, born in an era of ‘disposable’ fashion know too little about the natural benefits. Wool is a 100 per cent natural and renewable fibre. Sheep live on grass, water, fresh air and sunshine. Wool is a fibre that is grown – not man-made. Every year, sheep produce a new fleece, making wool a renewable fibre source. For more Pictures log on to my Instagram feed.